There's a brand new addition to the Bush dynasty, and no, it's not a person. On Monday, former President George H.W. Bush posted a photo of Sully, his new service dog, to introduce it to the world. Sully H.W. Bush is a yellow Labrador service dog trained by the Guide Dog Foundation and America's VetDogs, a nonprofit organization that gives service dogs for free to veterans and active-duty service members. Sully is named for the "Miracle on the Hudson" pilot Chesley "Sully" Sullenberger III. Sullenberger landed a damaged plane on the Hudson river in 2009, saving all the passengers and crew members abroad as a result. Sully can perform a two-page list of commands, according to CNN. The included commands include answering the phone or bringing items to Bush. "As one person said, he can do just about anything except make you a martini, but not to worry, he can go get you someone to make you a martini!" spokesman Jim McGrath told CNN. Not to mention, Sully already has an Instagram account, which posted the first photo today. The elder Bush has developed a form of Parkinson's disease and uses a wheelchair and electric scooter, according to The Associated Press. His wife, Barbara Bush, died in April, and Bush was hospitalized in late May due to fatigue and low blood pressure, according to NPR. To introduce Sully, Bush sent a tweet with a photo of himself, former President Bill Clinton (who was visiting), and Sully. "A great joy to welcome home the newest member of our family, "Sully," a beautiful -- and beautifully trained -- lab from @AmericasVetDogs. Could not be more grateful, especially for their commitment to our veterans," Bush wrote. In reply, America's VetDogs wrote, "This is truly our honor." According to their site, America's VetDogs are provided at no cost to vets, active-duty service members and first responders to create "enhanced mobility and renewed independence." The service animals can help people with a variety of disabilities, such as hearing loss or mobility loss. Each dog costs more than $50,000 to raise, train and place with the veteran. Sully will be a great help in Bush's everyday life, but "more than anything else the dog will be a wonderful companion," Bush aide Evan Sisley told The Associated Press. "He's a really sweet dog," Sisley added. If you're not convinced, look at their cute face, waiting for a new home at Walker's Point, the Bush family compound in Kennebunkport, Maine. This is the first photo posted to the Labrador's new Instagram account. Sully H.W. Bush's Instagram bio reads "A kinder, gentler Labrador — making my forever home at Walker's Point." The account will post photos from Sully's point a view, and spotlight how service animals can assist people with disabilities, according to CNN. Sully isn't Bush's first dog. While he was president, he had at least two dogs. According to the Presidential Pet Museum, Millie was one the most famous presidential pets. 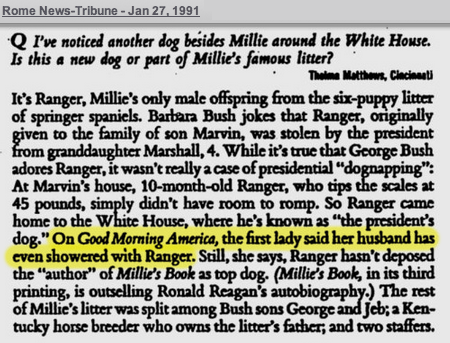 Millie was an English springer spaniel, and she "wrote" New York Times best seller Millie's Book: As Dictated to Barbara Bush in 1992. The book was about a day in the life of a White House dog, which included attending important briefings and chasing squirrels after meetings in the Oval Office. Bush's favorite pet was Ranger, according to the museum. He was named for the Texas Rangers baseball team. Ranger was a brown and white springer spaniel, who he originally gave to his granddaughter. Eventually the family agreed that Ranger needed to come back to Bush at the White House. They were so close that Barbara Bush told Good Morning America that Bush and Ranger even showered together at least once. With Sully's arrival, it looks like Bush is prepared to develop another close friendship with a new pup. Correction: A previous version of this story misspelled Chesley Sullenberger's name. It has been updated.